India's Abhilash Tomy gestures on his boat Thuriya as he sets off from Les Sables d'Olonne Harbour on July 1 at the start of the solo around-the-world "Golden Globe Race" ocean race in which sailors compete without high technology aides such as GPS or computers. 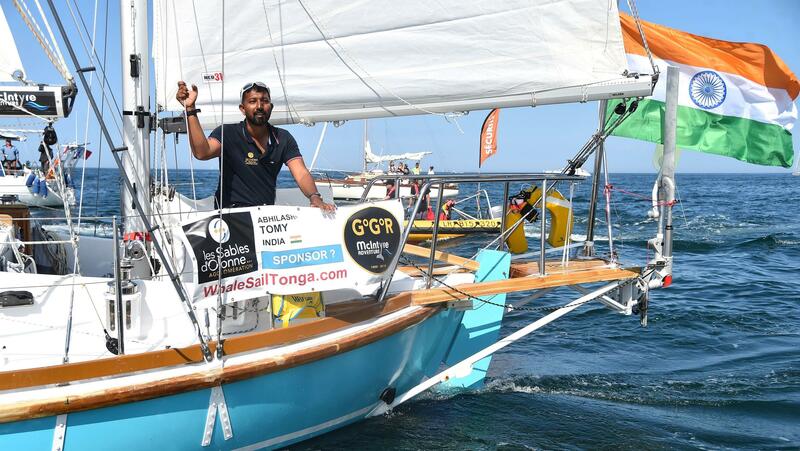 Tomy was participating in the Golden Globe non-stop, unassisted, round-the-world race, a revival of a famous 1968 race. Participants shun modern electronics, such as GPS, for navigation and instead use sextants and celestial navigation to find their position at sea. In the original Golden Globe race, several participants were forced to quit, one refused to finish despite being in the lead and another died by suicide after stepping off his boat. Tomy's two-masted ketch is a replica of Suhaili, the boat that ultimately won the race. Of the 18 sailors who entered this year's Golden Globe, Tomy and seven others have dropped out. One other boat was also dismasted in the same storm that damaged Tomy's. The BBC reports that "Tomy was able to communicate using a texting unit, after his satellite phone was broken. He managed to send an initial message saying he has a severe back injury and was immobilised, unable to eat or drink." Since the first report of Thuriya's dismasting on Friday, rescue efforts had been underway by India and other countries. The Indian navy spokesman was quoted by NDTV as saying that Tomy sent a "ping" with his Emergency Position Indicating Radio Beacon, or EPIRB, when aircraft approached his position.